“Oh no, not another collection!” screams everyone that knows me. Meanwhile, I’m grinning ear to ear like the Grinch and basking in these feelings only a crazed collector would know. Yes, I started another collection but this one was started years and years ago, even before I was born, without me knowing it. Sometimes collections happen like that and it is only a matter of stumbling upon a few other similar items that make you stop and think, hey I have something like that. You see, my dad gifted my mom that exact tiny key charm set with a minuscule ruby when they first started dating. I don’t ever remember my mom wearing it growing up, but I do remember it always catching my eye when I would play in her jewelry box. It was different than her other pieces of jewelry, maybe because it was one of the few pieces of fine jewelry she owned. Most everything else was costume or big bead necklaces…hey, it was the 70s after all. When we moved to Tennessee, she left behind lots of her jewelry and luckily this charm she brought with her and she gave it to me. There was something special about this key and it continued to resonate with me, always bringing me joy when I saw it. The largest key of the bunch is another piece that has some sentimental meaning behind it. As I’ve mentioned previously, my grandparents would travel to Italy once every two or so years and bring back gold jewelry for my sisters and I. On one occasion, this was the piece I chose from what she brought back–I believe I was in middle school when I received it. I didn’t really wear it much but there was always something special about it. I went through a few rounds of selling/scrapping lots of gold pieces in my life and this one I could never get rid of (even though I never wore it). Fast forward to last week when I was in Maine and visiting Market Square Jewelers. They have a section of cases in the back which house a unique assortment of charms. I was looking through all the rows and rows of charms, when I saw a group of key charms. 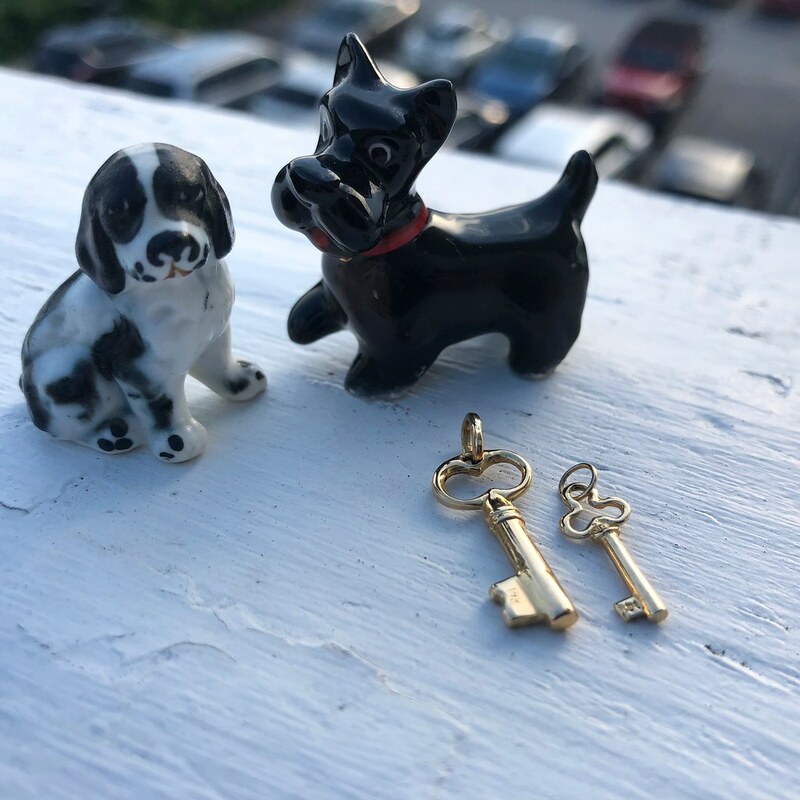 All of them together sparked the inclination of starting a key charm collection and the stars aligned that day, as I walked out with two new ones to jump start my mini tribe. I’m excited to add to this new collection as collections are always most fun in the very beginning stages. If you have any gold key charms that you want to sell or if you find any while hunting (both in real life or online) feel free to let me know! Want more? Take a deeper look into my personal collection.